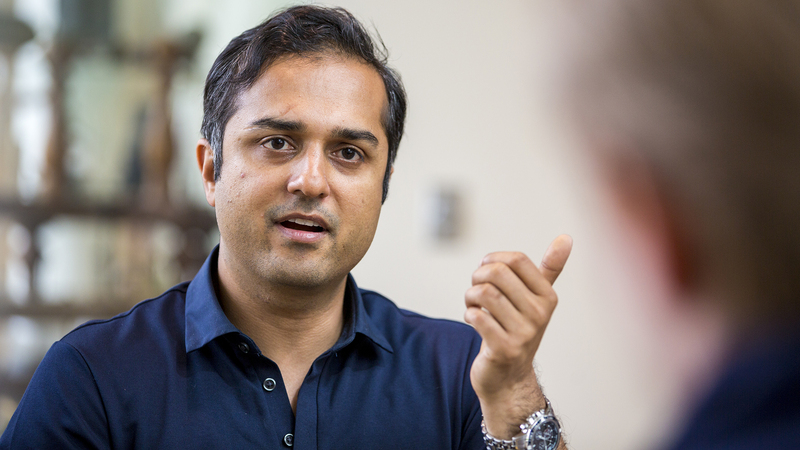 When the recession hit in 2008, Rishi Misra ’01 parted ways with Deloitte, a large corporate consulting firm that had employed him for almost five years. This was a gamble not only because he had to find employment, but because the India native also had to restart the green card application process from scratch. If he couldn’t find a company that could sponsor his green card application, he’d have to leave the United States and possibly never return. Time was running out. In 2009 he landed a job with a startup in San Francisco that hired a small immigration law firm to help. Eight months later Misra had a number in the green card line, but by then the line wasn’t moving. Feinstein’s staff told him that if you remove per-country limits, people from less populous countries won’t get a chance in the employment-based system because India and China would dominate the whole quota. Misra thought that was fair. Intent on sharing his views about how to fix the system, in 2013 Misra started attending meetings held by FWD.us, a political advocacy group founded by Mark Zuckerberg, Bill Gates, and Reid Hoffman — the Who’s Who of tech — to modernize the immigration system and keep the United States competitive. Meanwhile Misra was still stuck in the green card line. So in 2016, he decided to apply for the “alien of extraordinary ability” category, an EB1 visa. This is the fastest line and has tougher criteria to qualify. Some of the 10 criteria are reserved for artists, entertainers, and athletes. Misra applied for five criteria, including making original contributions of major significance to his field. “I think that’s a great thing because it doesn’t measure me on contributions to any single company but measures me on contributions to my field, which in a sense are my contributions to the United States,” he says. “I had to have people that I didn’t even know vouch for the fact that the work I had done, in building a company and creating jobs, among other accomplishments, were of major significance. It had to be completely objective and unbiased,” he says. He had to meet three of the 10 criteria to qualify and thinks he got four. In October 2016, Misra was granted a green card and looks forward to becoming a U.S. citizen by 2021. Unlike the EB1 visa that Rishi Misra qualified for based on his individual accomplishments, the H-1B is employer-based. Companies in the United States apply for these visas on behalf of workers they want to hire because they have specialized knowledge, typically in science, engineering, or information technology, and a bachelor’s degree or its equivalent. Misra worked on an H-1B visa for 12 years because his first employer didn’t follow the green card application process as well as it might have. They parted ways and he had to find another employer who could start the process over. Misra says, “The high-skilled visa is pretty controversial. One of the issues with that visa is the quota is limited to 65,000, and then another 20,000 for people with U.S. graduate degrees. Most of that quota is taken up by a handful of companies, and when you look at who those companies are, all those companies have outsourcing as a significant business component and revenue source. Rishi Misra ’01 was very good at physics in high school, so when his high school physics teacher told him to apply to Grinnell, he did. He was also interested in engineering, so he pursued a 3-2 program in biomedical engineering at Washington University in St. Louis, transferring after his third year at Grinnell. He earned his B.A. in physics from Grinnell, a B.S. in biomedical engineering at Washington, and then an M.B.A there too. One reason Misra wanted to stay in the United States was to do something innovative in biomedical engineering, which he couldn’t do back home in India. Bangalore has since become India’s version of Silicon Valley, but when Misra was looking for work in 2003, it wasn’t yet.